Well I guess it's safe to say I'm on a jam kick right now! I laugh at this because honestly, in our fridge there are about 5 billion jars of jam in all shapes, sizes and tastes! Oh, and all are indeed opened because sometimes you just want a spoonful of apricot and other days you just want a knife tip's worth of fresh fig. My tastebuds totally control me. Whatever. The good news is I married a man who totally gets this fact of life and joins me on more than one occasion. No joke, we'll be in the middle of Castle (*Holla! *) (shhhh, we're only on season 4 right now...NO SPOILERS!) and all of a sudden need a "snack". Show will then be paused, we'll get up, and spend the next 5 minutes in the kitchen, eating spoonfuls of jam and homemade peanut or almond butter. Sometimes in complete silence, haha. So like how all of my jam stories start, I came across 75 tons of fresh heirloom tomatoes (thanks mom!) the other day. This summer has been so kind to us, produce-wise! It seems anyone who has plants have had an abundance of production, this year! That's just fine by me! They give us amazing fruits and veggies and we return the favor with yummy foods made with 'em! Now let me state for the record that I keep making jams because the abundance of produce we've been generously given is a ridiculous amount! I mean...there's only so many ways you can eat fresh tomatoes before the bowlfuls you STILL have begin to turn for the worst and you need to do something with them, STAT! And I mean BOWLFULS. My mom's tomato plants went cray-cray this year. Yum! I did however, find out through this tomato abundance, that tomatoes make my acid reflux act up pretty bad. Y.a.a.a.a.y. Like that's going to stop me from eating them though- I love tomatoes more than most foods out there. So this jam was created because 1. I love jam and 2. I love tomatoes. The end. 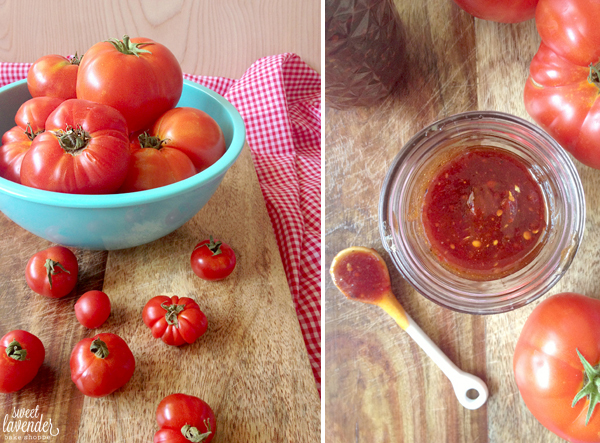 Plus, tomato jam is like all the rage right now (as it should be)! I know most people associate tomatoes with savory cooking, but being (technically) a fruit- it is also REALLY good sweetened! If you've never tried tomato jam, I urge you to try this stuff. Uh-may-zing! 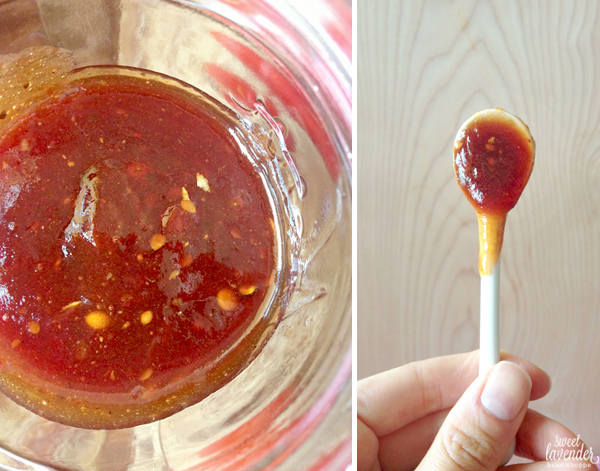 I've added sweet and savory ingredients to the mix to really give the jam a complex flavor boost. Don't be afraid of the chili flakes, either- they're pretty mild in this, after all is said and done. 1. In a square of cheesecloth, add your chili flakes, bay leaf, peppercorns, cinnamon stick, mustard seeds and coriander seeds. Bring edges of cloth up, so it makes a little pouch or bag and tie twine around TIGHT, securing the bag closed. Here is a great picture tutorial, should you need. 1. In a medium large non-reactive saucepot, add your sugars, lemon slices, water, vinegar, salt, and bouquet garni bag of spices. Bring to a simmer over medium high heat while stirring around with a wooden spoon. Turn heat to medium low and allow to gently simmer for 15 minutes, stirring occasionally. 2. Next, add your chopped tomatoes and turn heat back up to medium high heat. Bring mixture back up to a simmer, while stirring occasionally again- the coolness of the tomatoes will have brought the temperature of the sugar mixture down a bit. Once simmering, turn heat back down to medium low and allow to gently simmer for another 25 minutes. You'll need to stir the pot more frequently as those tomatoes cook/break down. Half way through the cooking, I started to break up the tomatoes myself with the back of my wooden spoon. 3. While this mix is cooking, wash and thoroughly dry all your glass canning jars. Set aside. 4. After 25 minutes, turn heat off and remove and discard the bouquet garni bag and any large pieces of lemon. I did leave a lot of the lemon slices in the pot- it added great flavor! With a stick blender, blend everything together, right in the pot! If you don't have a stick blender, feel free to carefully add mixture to a food processor or blender and give it a quick blend. Make it as smooth as you wish. I used my stick blender for maybe 10-15 seconds. 5. Add mixture back to pot and back to a medium low heat. Bring back up to a gentle simmer and turn heat to low. Now you have to stir frequently- as it will burn on the bottom, if you don't. 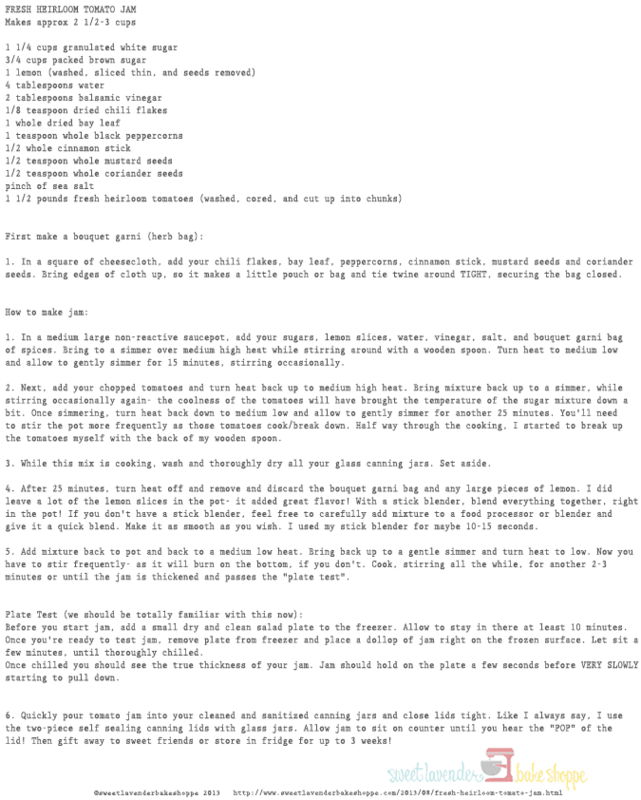 Cook, stirring all the while, for another 2-3 minutes or until the jam is thickened and passes the "plate test". Before you start jam, add a small dry and clean salad plate to the freezer. Allow to stay in there at least 10 minutes. Once you're ready to test jam, remove plate from freezer and place a dollop of jam right on the frozen surface. Let sit a few minutes, until thoroughly chilled. Once chilled you should see the true thickness of your jam. Jam should hold on the plate a few seconds before VERY SLOWLY starting to pull down. Click here for a nice picture tutorial. 6. 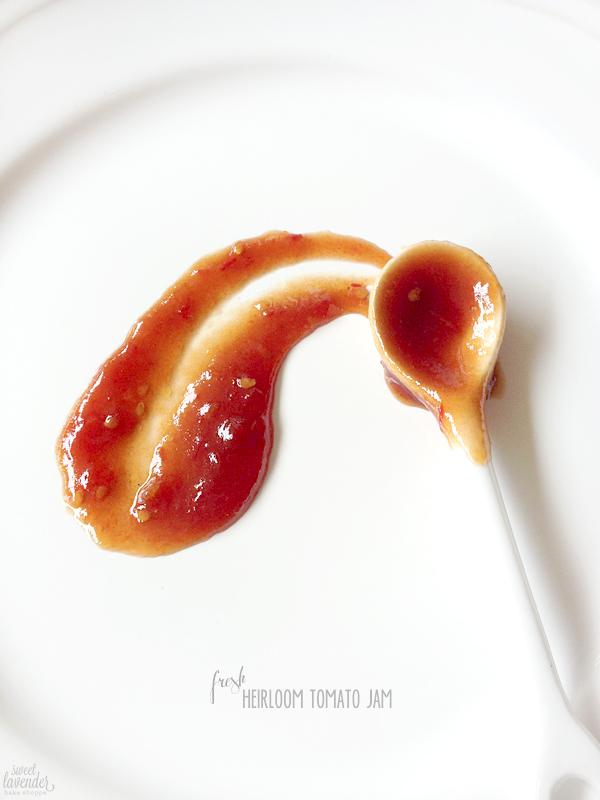 Quickly pour tomato jam into your cleaned and sanitized canning jars and close lids tight. Like I always say, I use the two-piece self sealing canning lids with glass jars. Allow jam to sit on counter until you hear the "POP" of the lid! Then gift away to sweet friends or store in fridge for up to 3 weeks! 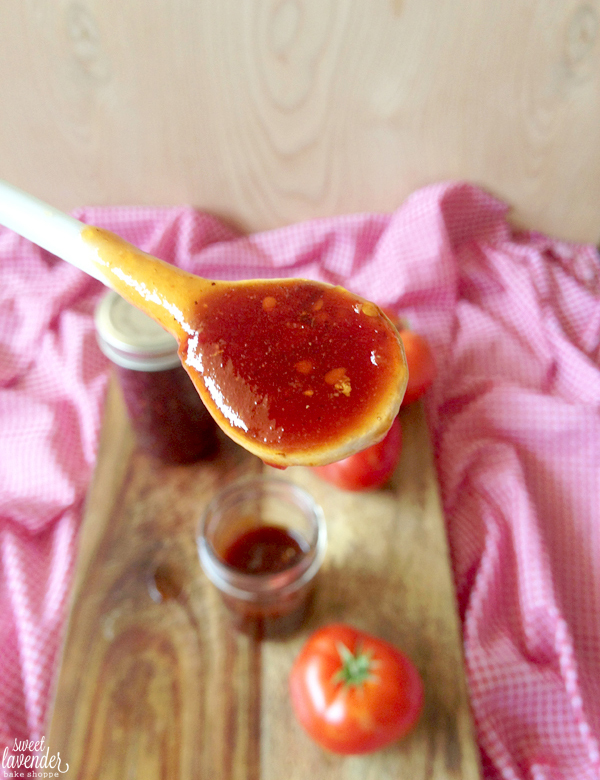 Being both sweet with a hint of savory, this jam is completely versatile! Use it on cheese and crackers, top a baked brie, serve alongside your BBQ or picnic spread, smear it on paninis or sandwiches, brush on top of meat, poultry or fish...I mean really- the choices are endless! Me? I've been eating it with a spoon straight out of the darn jar! But when we've decided to become a tad more civilized, we've eaten it with honey whole wheat pretzels, whisked in a bowl with apple cider vinegar and olive oil and marinated veggies in the concoction before grilling, processed together with fresh garlic, balsamic vinegar, and olive oil and smeared over pizza dough as a sauce base, and so on!